The greater our vocabulary, the greater our ability to think in that language! This manual incorporates a visual for each vocabulary word to help it stick more readily in the learner’s mind. Intended as a companion to the French 1A and 1B texts. Grades 9–12. Abundant pronunciation helps. The Vocabulary Manual begins with approximately 40 pages of keys and practice for accurate pronunciation. Pronunciation CDs (sold separately) are also available to start the new language learner off right! Practical layout for memory work. 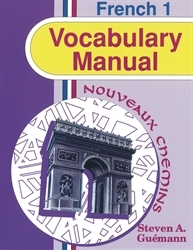 The introductory lessons and 35 chapters each containing approximately 20 to 30 vocabulary words feature pictures with English words on one side of the page; the same pictures with the French words are on the reverse side for self-drill or interaction as the parent uses the Teacher’s Edition (sold separately). A vocabulary exercises section gives spaces for writing the French translation four times, aiding both memory and French spelling. Vocabulary for everyday use. An introductory expressions section gets your language learner communicating immediately as he learns common greetings, introductions and farewells, questions and answers, and favors and courtesies. The chapters encompass common terms needed to express everyday ideas, including words for sharing faith in Christ! Cultural helps. Notes in the margin about various words explain the difference in meaning between a French word and its corresponding English translation or give specifics about appropriate contexts for using a word. Handy reference charts and dictionaries. Appendix includes a grammatical summary that provides quick reference and aids understanding since the language learner can see grammatical patterns. A French-English dictionary and an English-French dictionary in the back provide quick help.